Being a natural squirrel has helped over the years in my quest for the best denims both old and not so old. I have hoarded so much from all over the World, over my many years in denim that to choose the best is hard. Being a denim fabric head draws me to the denim first, style second. But for me the most successful are those pieces where the denim and the shape work in harmony. 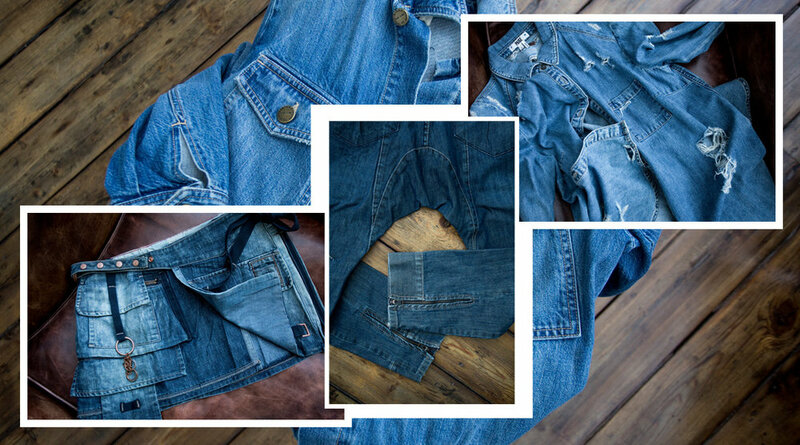 So here I share my archive edit of pieces significant by their detail; the denim fabric; their shape; their shade and their aged worn effects. What is wonderful about being a blue human in the 21st century is the lack of inhibition in dressing without censure. This has enabled us all to be free of dress codes to be who we want in terms of our personal expression to the outside World which in denim dressing is as exciting as it gets. The iconic brilliant indigo blue resulting from multiple washes is a truly special colour. It has an enduring romance like no other colour. But that is a longer story. The pretty bright blue is here combined with random rips and tears in this Paige oversized shirt. No so old but nonetheless a great easy piece. This tiny "skirt belt" is an example of creative thinking from M+F Girbaud from around 20 years ago. Along with Osklen from Brazil dropped crotch riding jeans in tinted green casted indigo they are both examples of good denim and cutting. Icons such as the Cap E Levi jean jacket have always held a romantic attachment for me. 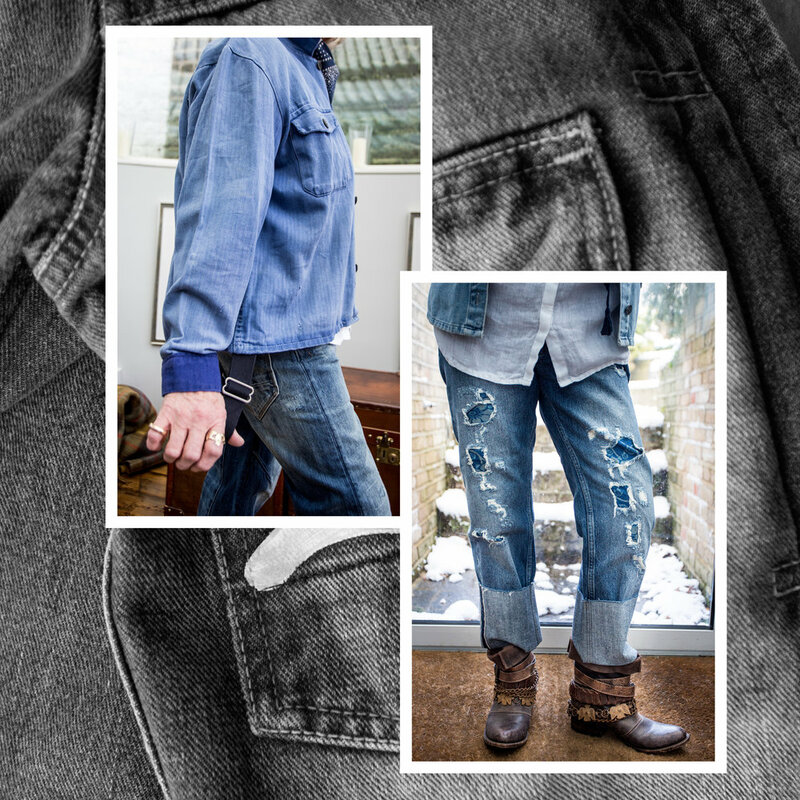 Not only for the tucked front detail but also for the old ring denim - nothing like it !! Combined with the high low contrast at the twin needle seams makes for the most special garment ever. Natural Indigo is what drove the acquisition of both the Geo Trowark oversized chunky knit and the Japanese work bag, complete with rips and repairs = lots of memories. Clever cutting and creative stitch details were what Levis were doing for their Red collection in the Far East way back in the early part of this century. What a pity such items of beautiful design did not stay long in their offering. My Fiorucci vintage skirt is a real treasure from the 1960's evocative of the Kensington Market and Biba era, the hippie beading and recycled denim panels combine to make the heart flutter. So sad it no longer fits!! Overdyed original workshirt in indigo herringbone. Simple function at its soft best. Combine MiH huge cuffed ripped and Shibori decorated Phoebe jeans with Free People's crazy Mexican western boots. The right details will sell a garment any time. From the back buckled Cap E Levi jacket; to the contrast cuffs on the work jacket; giant button and edge stitching features on the Levi Red jacket; oversized back pockets and true green shade on these Levi Red jeans; Original vintage work style jeans.